Born in Paris on January 11, 1831, Charles-Olivier De Penne was a French painter and illustrator of the Barbizon school. He was a student of Léon Cogniet (1794-1880) at the École des beaux-arts in Paris, and Charles Jacque (1813-1894). He is best known for his paintings of animals, hunting scenes and historical pieces—all great loves of De Penne. His marvellous understanding and close study of his subject is evident in the quality in which his characters are produced. 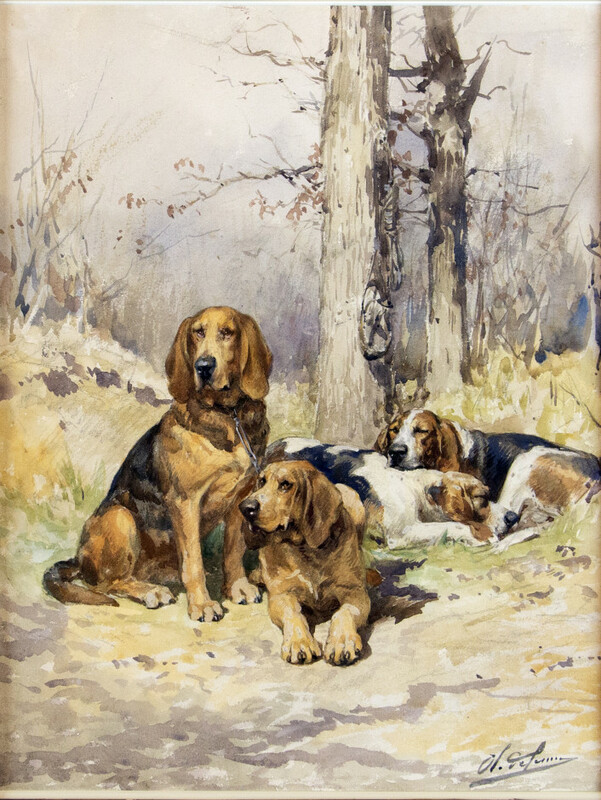 He would regularly paint from life and attended hunts involving dogs—helping him capture and skillfully render each dog’s specific character, morphology and personality. De Penne won second grand prize in the Prix de Rome for his painting, Jésus et la Samaritaine. First prize was awarded to Jules Didier who had painted the same subject. De Penne frequently exhibited in the Paris Salon, winning the bronze medal in 1872 and the silver medal in 1883. At the Paris Exposition of 1889 he, along with Daniel Ridgway Knight, were awarded silver medals. During his lifetime, De Penne’s sporting and animal paintings were highly sought after by collectors throughout the world. He continued to exhibit until his death on April 18, 1897. A monument was erected by the commune of Bourron-Marlotte in front of De Penne’s house in the rue du General Leclerc. inscribed in blue crayon, "O de Penne / Ms Lemieux / Ess? (indistinct) / Paris (verso).